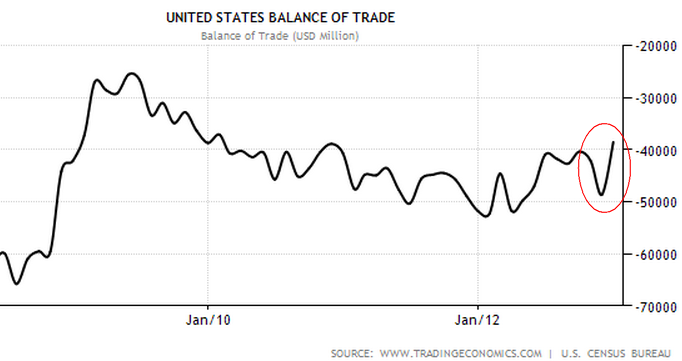 Some folks in the media are making a big deal out of the US trade deficit decline in December. That's how much the U.S. trade deficit shrank in December from the previous month, the U.S. Commerce Department said Friday. The gap between imports and exports was the smallest since January 2010 and much less than the $46 billion expected by 73 economists in a Bloomberg poll. The deficit was cut by record exports of refined petroleum products to countries such as Brazil, combined with lower imports of crude oil. Yes, that's an impressive showing indeed. But let's take a look at the chart, because such numbers should not be viewed in isolation. The decline in deficit follows a sharp increase a month earlier. The deficit increase in November was driven by hurricane Sandy, and was exacerbated by the Northeast US refineries' shutdowns. Fuel output in November dropped materially. The lower imports in December are therefore distorted by the reversal of the "Sandy effect". Trade deficit excluding fuel in fact declined less sharply than the overall number in December. This is clearly a welcome result, but the real trend will not be fully visible until the January numbers are out.